What is Tungsten Kinetic Energy Penetrator? Tungsten kinetic energy penetrator (also known as a KE weapon) is a type of ammunition that, like a bullet, does not contain explosives and uses kinetic energy to penetrate the target. The opposite technique to tungsten kinetic energy penetrator uses chemical energy penetrators. There are two types of these shells in use: high explosive anti-tank (HEAT) and high explosive squash head (HESH). They have been widely used against armor in the past and still have a role but are less effective against modern composite armor such as Chobham as used on main battle tanks today. maximizing the mass of whatever (albeit small) volume is occupied by the projectile—that is, using the densest metals practical, which is one of the reasons depleted uranium is often used. Tungsten kinetic energy penetrator has led to the current designs that resemble a long metal arrow. Concentration of force into a smaller area was attained by replacing the single metal (usually steel) shot with a composite shot using two metals, a heavy core (based on tungsten) inside a lighter metal outer shell. These designs were known as Armour Piercing Composite Rigid (APCR). On impact, the core had a much more concentrated effect than plain metal shot of the same weight and size. 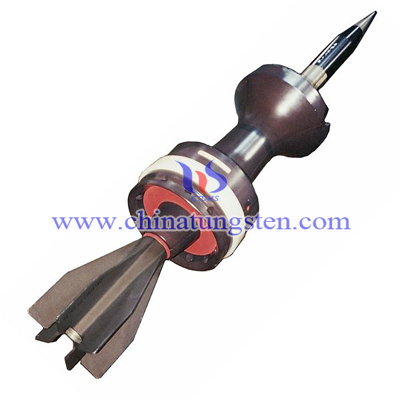 To maximize the amount of kinetic energy released on the target, the penetrator must be made of a dense material, such as tungsten carbide or depleted uranium (DU) alloy (Staballoy). The hardness of the penetrator is of less importance, but is still a factor as abrasion is a major component of the penetrator defeat mechanism.A common misconception is that, during impact, fractures along these bands cause the tip of the penetrator to continuously shed material, maintaining the tip's conical shape, whereas other materials such as unjacketed tungsten tend to deform into a less effective rounded profile, an effect called "mushrooming". Actually, the formation of adiabatic shear bands means that the sides of the "mushroom" tend to break away earlier, leading to a smaller head on impact, though it will still be significantly "mushroomed". Tests have shown that the hole bored by a DU projectile is of a narrower diameter than for a similar tungsten projectile.That is one of the reasons why tungsten kinetic energy penetrator is better than the DU it is. Tungsten alloy can be used as the component in the tungsten kinetic energy penetrator, and Chinatungsten Online can provide the product. If you have questions, please feel free to email us: sales@chinatungsten.com or call us : 0086 592 512 9696, 0086 592 512 9595.